Rediscover the delight and innocence of childhood in these classic poems from celebrated Scottish author, Robert Louis Stevenson.From make-believe to climbing trees, bedtime stories to morning play and favorite cousins to beloved mothers.Here is a very special collection to be treasured for ever. First published in 1885, the first printing of A Child's Garden of Verses ran 1000 copies by Longhaus, Green and Co in London. This book was not illustrated until the 1896 edition, published 2 years after Stevenson's death. The collection contains about 65 poems, and many of the poems, including “The Land of Counterpane,” take a positive perspective on Stevenson's own childhood which was plagued by sickness. He dedicated the work to his nurse Alison Cunningham. Stevenson was a Scottish novelist, poet, essayist, musician and travel writer. (13 November 1850 – 3 December 1894) Although he died at just forty four years old and suffered from ill health the majority of his life he managed to travel and write extensively in that short period. His most famous works are Treasure Island, Strange Case of Dr Jekyll and Mr Hyde, Kidnapped, and A Child's Garden of Verses. Although Stevenson fell out of the canon for a number of years, today he is one of the most translated authors and is highly celebrated for his stories. capture a childs quality of imagination, sense of wonder, and intense enjoyment of experience (Meigs, 293-4, 408). Prideaux 14. Hayward 297. Grolier Club Stevenson 55. Gerstley 20A. Gumuchian 5440. Osborne II:662. Booksellers small ticket.Endpapers lightly toned. Cloth with only very light rubbing to spine ends and extremities. A lovely copy in near-fine condition. London: Longmans, Green, 1885. First Edition. Aside from very minor rubbing, a fine copy. In a custom quarter red morocco slipcase (some wear). Condition: First Edition. Aside from very minor rubbing, a fine copy. In a custom quarter red morocco slipcase (some wear). London: Longmans, Green, and Co., 1885. Pp. x, 101. Blue, silk-grained cloth boards with bevelled edges, 'The Sign of the Ship' gilt-stamped to upper left of front cover, gilt spine lettering, top edge gilt, others untrimmed. Very, very slight soiling to covers with just a bit of rubbing to the joints, spine ends, and tips, front free endpapers tanned as usual, edges a bit dusty, interior clean and bright. A lovely, collectible copy. Prideaux 14.. First Edition. Hard Cover. Very Good Plus.. 12 Mo..
London: Longman's Green & Co, 1885. First Edition 1st Printing. Hardcover. Near Fine Book. 6 1/2" Tall. 101 Pp., With Two Preliminary Blanks, Adverts. Page, Half-Title, Three Final Blanks. Attractively Bound In Well Preserved 3/4 Dark Morocco, Five Bands, Gilt Title And Author, Over Beautifully Marbled Paper Boards, Matching Hand Marbled Endpapers. Top Edge Gilt, Deckled Edges. First Printing, First Issue, One Of 1000 Copies, With No Mention Of "Two Series" In List Of Books By Stevenson. No Names Or Marks Or Stains Or Other Damage, Pages Clean And Just A Little Aged [With One Very Small Foxing Spot]. Gift Quality. Ex Collection Of Dorothy Gish But Not Marked As Such. London: Longman's Green, and Co., 1885. Small octavo. Blue cloth, lettered in gilt, bevelled edges, t.e.g., others untrimmed. Binding darkened and worn, with chipping to spine ends, old (and now elapsed) repairs to inner hinges between endsheets and text block, endsheets darkened (and rear pastedown bubbled), shaken, one leaf carelessly opened, with marginal chip; a heavily used and traveled copy, with fine provenance. "Second edition" (i.e. second printing of the first edition). A fine family association copy, inscribed by Stevenson's mother on the half-title: "John Balfour from his affect Grand Aunt M.I. Stevenson October 1885." Margaret Isabella (Balfour) Stevenson (1829- 1897), or "Maggie" (as she was known to her family), married Thomas Stevenson in 1848 and gave birth to RLS in 1850. She had a strong and loving relationship with her son. Although quarrels between RLS and his father about religion, his career and his marriage were upsetting to the family, the family remained close. After her husband died in 1887, Maggie went with RLS and Fanny on their travels to America and the South Seas and even settled with them in Vailima. She returned to Edinburgh to live with her sister after RLS died. BEINECKE 195. HAYWARD 297. PRIDEAUX A35. London: Longmans Green, and Co, 1885. First edition (1000 copies printed). Small 8vo. x, 101 pp. This volume of verse was dedicated by Stevenson to his childhood nurse Alison Cunningham, the dedication itself a poem, one of 64 included in the volume. Prideaux 14. Gumuchian 5440. Osborne, p. 79 (for a later edition). Very good copy. Original gilt-stamped blue cloth (slightly rubbed on corners and spine ends, spine and bevelled edges somewhat darkened), top edge gilt, others untrimmed. (9754). London: Longmans, Green, and Co.,, 1885. Octavo. Original blue cloth, bevelled boards, titles to spine gilt, publisher's device to front cover gilt, top edge gilt, others untrimmed. Spine darkened, two openings with old tape residue in gutter, a very good copy. First edition, first impression. One of 1,000 copies published. From the library of the bibliographer of Dickens and Trollope, Walter E. Smith, with his pencilled ownership inscription to the first blank recto. London: Longmans, Green and Co., 1885. Small 8vo, x, 101 pp. Blue-colored cloth over beveled boards, backstrip lettered in gilt, gilt publisher’s stamp on top cover. Top edge gilt. Trivial rubbing at extremities. Endpapers show some paste action. Internally fine. Housed in an Atmore Beach folding box and quarter-morocco slipcase. Very good. First edition. 1,000 copies printed in 1885 at five shillings each. Stevenson began work on this influential book of children’s verse after taking up Kate Greenaway’s Birthday Book for Children and proclaiming “these are rather nice rhymes, and I don’t think they will be difficult to do.” Grolier Children’s 100 #49. Prideaux 14, Hayward 297, Osborne II: 662. MARS, E.. STEVENSON,ROBERT LOUIS. A CHILD'S GARDEN OF VERSES. NY: R.H. RUSSELL (1900). Large square 4to (12x12"), blue pictorial boards, tips and spine extrems lightly rubbed else Fine. 1st edition of perhaps the most lavish of all illustrated versions of these poems and possibly the first edition of these poems with color illustrations. This edition is illustrated by E.MARS and M.H. SQUIRE with lovely full page color plates and full page black and whites plus a profusion of text illustrations. The book is printed on heavy glossy stock and is truly beautiful. (This version was later issued in a much smaller and greatly abridged format). Due to the nature of the binding and its large size, very few copies of this edition survive in collectible condition. New York: Charles Scribner's Sons, 1905. First edition. Original black cloth with color pictorial insert on cover, gilt lettering on spine, color pictorial endpapers. Color illustrated title page, 12 full page color plates, tissue guarded, with captions, line drawings throughout, all by Jessie Willcox Smith. Arguably her finest and most heralded illustrated book. The rare First Issue, satisfying all the points in Nudelman A22: a) MCMV on title-page, b) No Scribner colophon on copyright page, c) insert impression measures 21.8 cm, d) "Charles Scribner's Sons" on copyright page measures 3.1 cm vs. 2.6 on later issues, e) cover insert with heavy gilt in sky, and f) "Scribner's" on spine at very bottom, lower than later issues. Also, top edges gilt (later editions lacking), others untrimmed. Black cloth with gilt lettering on spine, full-size color cover insert, illustrated endpapers, illustrated title-page, twelve full-page color plates with captioned tissue guards bound-in, all by Jessie Willcox Smith. A truly fine copy, the nicest we have ever seen. Scribner's, 1905. Book. Illus. by Jessie Willcox Smith. Fine. Decorative Cloth. First Thus. 8vo - over 7¾" - 9¾" tall. First Edition (1905) with Smith Illustrations. Fine copy (light staining to back panel).Near fine Fresh Jacket. $1.75 on flap.Difficult First. Jacket lightly chipped at crown.Beautiful Copy.. LE MAIR. (LE MAIR,H. WILLEBEEK)illus. A CHILD'S GARDEN OF VERSES by Robert Louis Stevenson. Philadelphia: McKay (1926). Oblong 4to (11 1/2 x 9 1/4"), green cloth, pictorial paste-on, Fine in somewhat worn dust wrapper. 1st edition with Le Mair's illustrations (preceding the British edition by several years). Illustrated by Le Mair with pictorial endpapers plus 12 magnificent color plates. This is a beautiful copy. London New York : John Lane, The Bodley Head ; Charles Scribner's Sons, 1896. First Edition. Provenance; Francis Graham Brown's copy with his name printed to the front paste-down. Damp stain extending to 3 sq. cms to the lower outer edge of the back board. Very good copy overall in the original gilt-blocked, decorated cloth. Spine bands and panel edges slightly rubbed and dust-toned only, as with age. Remains quite well-preserved overall; tight, bright, clean and strong.. Publisher's ads to the rear.Related item; Referenced by: Gumuchian 5441. Subjects; Children's poetry, Scottish. Children's poetry, English. Children's Poetry.. Genre; Children's books - England - 1896. Illustrated. OLVER, KATE. STEVENSON,ROBERT LOUIS. A CHILD'S GARDEN OF VERSES. London: Collins, no date, circa 1925. 4to (7 1/2 x 9 1/2"), full leather with round gilt pictorial vignette on cover, top edge gilt, p., FINE IN PUBLISHER'S BOX with color plate on cover (some fading to box). Illustrated by KATE ELIZABETH OLVER with color pictorial endpapers, 4 color plates plus numerous full and partial page black and whites. There is also a 14 page introduction by Laurence Alma Tadema. 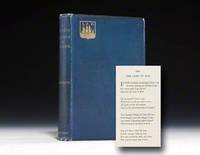 This is a very scarce edition of these classic poems, rare in the box. London: Longmans, Green, and Co., 1885. A fascinating and important first edition copy with outstanding provenance. The signature of R. M. Ballantyne is tipped onto the title page and an inscription to the front free end paper states 'from Jean Ballantyne 1902.' [Robert Michael Ballantyne, Scottish author of juvenile fiction, wrote more than 100 books the most famous of which 'The Coral Island'. was a strong influence on Robert Louis Stevenson (1850 - 94), who would later base portions of his famous book Treasure Island on themes in 'The Coral Island'. Jean Ballantyne is believed to be one of the daughters of R. M. Ballantyne, probably named after Balantyne's mother Jean. It is a moot point as to whether this was actually Balantyne's copy, though it would seem so; there is also a seemingly unrelated gift inscription on the front free end paper]. Pp. x, 101 [3 -blanks]; original end papers. Original blue cloth with bevelled edges, gilt lettering to the spine with gilt vignette to the front board, binding very good with a little general wear, slightly marked, head/tail of the spine and corners rubbed. Contents clean and tight, a few gatherings slightly out of line, end papers tanned, a few pages slightly dusty at edges, otherwise appears unmarked. A very good first edition copy, signed on a slip to the title page by R. M. Ballantyne. [Bibliographic note: this first edition copy mentions '(two series)' after 'New Arabian Nights' on the advert for books 'By the Same Author' and it would seem that might suggest it is a second issue of the first edition.]. By Author's Wife. First Edition. Hardcover. Very Good. 12mo. New York: Charles Scribner's Sons, 1905. (1905). TEG. 125 pgs. Black cloth with pictorial pastedown on front cover, gilt titling on spine, rubbed at extremities, light shelfwear to pastedown, internally bright and clean except 5 leaves with a faint stain at corner not interfering with text or illustrations. Color title page and 12 full page tissue-guarded color plates by Jessie Willcox Smith. Meets all points for first issue, Nudelman A22.. First Thus. Very Good -/No Jacket. Large 8vo. STEVENSON, Robert Louis. A CHILD'S GARDEN OF VERSES by Robert Louis Stevenson. Illustrated by Charles Robinson. New York:: Charles Scribner's Sons,, 1895. Advance publisher's sample of the first American illustrated edition, with illustrations by Charles Robinson-- consisting of two stapled signatures, including the title leaf, and sample pages of text and illustrations. . Front cover (i.e. illustrated title leaf) has one-inch surface tear, with half-inch loss of printed illustration, one small chip at spine margin (with no loss), else a near fine, partially unopened copy. . [see Prideaux p. 39 for the first English edition]. Twelvemo, pictorial self-wrappers,  pages (two signatures of 8 leaves (16 pages each), illustrated in black-and-white (by Charles Robinson), stapled. Leaves measure 7 5/8 by 5 1/8 inches. The leaves of the published trade issue, consisting of 136 pages, measure 9 3/4 by 7 3/4 inches. London: Longmans, Green, 1888. Third Edition. 101 pp. Spottiswoode & Co., Printers. 1 vols. 12mo. Blue original cloth, with mounted cover illustration by Smith. Fine copy in quarter blue morocco slipcase and chemise. Bookplate of Joan Whitney. Third Edition. 101 pp. Spottiswoode & Co., Printers. 1 vols. 12mo. London: John Lane, The Bodley Head, 1896. [Children's] First Illustrated Edition. Octavo (20 x 13cm), pp.xiv; 136; ; 16 of advertisements.Publisher's green cloth, showing a child holding a plant pot out of which roses sprout, surrounding a view of a formal garden, with gilt titles and further decoration to spine, rear board shows a girl digging at the base of a piece of decorative foliage in gilt; all edges gilt. Binding shows well, with some minor shelfwear and bumping to spine ends. Internally clean, with some faint spotting to flyleaves. Near fine. A children's classic lavishly illustrated, first published under the name "Penny Whistles", this collection of poems celebrates childhood - from the make-believe world of 'The Land of Counterpane' to the simple pleasure of 'At the Seaside', the curiosity of 'Auntie's Skirts' to the dreams of 'Foreign Lands', these poems capture a child's wonder and fascination with everyday things. The Duke of Rothsay, a tragedy. Edinburgh: printed for J. Wood, Bookseller, Luckenbooths. Sold by C. Elliot; and by A. Donaldson, at his shops in London and Edinburgh, 1780. Octavo. [iv], 97, [i]pp. Disbound. ESTC T105935..
Longmans, Green, and Co. London. 1895. EARLY EDITION, the same format as the 1885 First Printing. Small 8vo. (6.3 x 4.4 inches). A very good, bright copy. Finely bound for Sotheran's of London in early twentieth century full green calf. Single gilt ruled borders on boards. Spine with five raised bands, each with dotted gilt lines. Compartments ruled and lettered in gilt. Gilt double ruled lines with floral corner pieces to the inner boards. Marbled endpapers. Board edges with dot and chain design in gilt. Top edge gilt, others untrimmed. Minor rubbing to edges of both hinges but overall a very clean copy in an attractive good quality early leather binding. PEASE, BESSIE. STEVENSON,ROBERT LOUIS. A CHILD'S GARDEN OF VERSES. NY: Dodge Pub. Co. (1905). 8vo (5 n3/4 x 8 1/8"), blue pictorial cloth, rear cover slightly faded else VG+. Stated 1st edition. Illustrated by BESSIE COLLINS PEASE (Guttmann) with pictorial endpapers, 22 color illustrations plus a profusion of black and whites in-text. Nice! John Lane, 1907. (14) + 137pp +(4) + 6pp of publisher's adverts. Engr title page. Engrs throughout. Foxing on endpapers. Green cloth with gilt title. Gilt vignettes on front cover and spsine. Page edges gilt. Spine very slightly faded. Presentation copy with an inscription by the Illustrator. . Hard Cover. Very Good +. Illus. by Robinson, Charles. 12mo - over 6¾" - 7¾" tall. NY: David McKay, 1926. First edition. Hard cover in original cloth. Published NY: David McKay, 1926, first printing. Oblong 4to., 9 1/8" x 11 1/2", 89pp., illustrated by H. Willebeek Le Mair with 12 full page color plates, b/w pictorial endpapers. Green cloth with gilt tiles, color pictorial cover inset, decorative text border. Some fade toning to the cloth along edges, spine lettering bit dull, mild wear at the tips. Very good. . Hard. Very Good/No Jacket. Illus. by LE MAIR, H. WILLEBEEK. 4to. London: John Lane the Bodley Head Ltd., 1896. First illustrated edition with illustrations by Charles Robinson. 144 pages plus 16 pages of adverts at rear dated 1895. Endpapers are lightly browned, occasional foxing spots and some occasional marks on some pages, endpapers are split at hinges but binding is sound, edges of pages are all gold a little dulled crease at bottom corner of title page. First blank page has neat Christmas 1895 dedication to former owner from their godmother M H Bonham Carter plus another shaky dedication below from daddie dated 1926 and another date 1927 at bottom of page , obviously given as presents at different times.Outer covers have a few light marks and gold a little dulled especially on spine, little rubbed on edges. Not a perfect copy but still a sound attractive copy SEE IMAGE. DETAILED IMAGES AVAILABLE ON REQUEST. First Illustrated Edition. Gold Embossed Boards. Good/No Jacket. Illus. by Charles Robinson. 7 ½ x 5 Inches. Hardcover. New York: Charles Scribner's Sons, 1905. Hardcover. Very Good +. drawings by Charles Robinson. RUSSELL, DOROTHY. STEVENSON,ROBERT LOUIS. A CHILD'S GARDEN OF VERSES. Philadelphia: John C. Winston (1928). 8vo (5 3/4 x 8 1/4"), 122p., pictorial cloth, slight cover soil, VG+. First edition with these illustrations. Illustrated by DOROTHY RUSSELL with pictorial endpapers, color frontis plus a profusion of charming full page and smaller black and whites. An uncommon edition. N/P: The Limited Editions Club, 1944 Number 141 of a limited edition of 1100 copies numbered and signed by the illustrator. Dark brown leather over spine shows a little rubbing near ends. Lovely textured paper over boards. Volume remains tight and is otherwise clean and intact. Housed in original clamshell case what is a little faded over spine edge and upper edge. Case remains solid and otherwise clean. Lacking publisher's newsletter. . Signed by Illustrator. First Edition, Thus. Quarter Leather. Very Good+/No Jacket. Illus. by Roger Duvoisin. sm 4to. New York: Dodge Publishing Co, 1905. First edition. Hard Cover. very good. Blue cloth with pictorial design on cover. 113pp. Over 20 delightful color illustrations by Bessie Collins Pease.Light crease to page 18 Edges rubbed. Inner joint cracked. Charles Scribner's Sons, 1905. A very good oversized black hardcover with paste-on illustration to cover (a couple small blemishes). Light edgewear. 12 Color plates with tissue guards (one guard missing). Very clean interior (a couple fingerprints). 1st edition 1905.. Hard Cover. Illus. by Jessie Willcox Smith. Franklin Watts, Inc, 1966-01-01. Hardcover. Used:Good. Longman's, Green & Co London 1885. 2nd edition. Gilt on blue cloth, teg, 101pp. Gift inscription, light foxing pages edges, small marks on covers o/w good. BURD, CLARA. STEVENSON,ROBERT LOUIS. CHILD'S GARDEN OF VERSES. Akron: Saalfield 1930. Folio, cl. backed pict. bds, Fine in frayed dw. Beautifully illustrated by CLARA BURD with 8 rich full page color illustrations to accompany Stevenson's classic poems.